Toyota Hilux Vigo Single Cabin is the best-suited pickup vehicle in Tanzania because of its demographic area and natural living style. The Tanzanian People are extremely fond of importing sports utility vehicles and dynamic rugged strong pickup trucks for a pleasurable outdoor wildlife safari adventure expedition with family and friends all together. Dar es Salaam, Mwanza, Arusha, Dodoma, and Mbeya are five leading cities of Tanzania where there is a huge import of Toyota used pickups and SUV’S. Toyota Hilux Vigo Single Cabin is a 4-wheel Drive off-road pickup built with a robust muscular design and composed of glittering shine accessories such as bigger rectangular shaped front LED headlights, front chrome metallic vertical bar grille, lower grille, indicator lights, front side bumper, under spoiler front round shaped front fog lights, power side view door mirror with LED Turn Signal indicator lights, and alloy wheels. On the rear side, it provides a bold dashing catchy stylish display for customers added with a high mount stop light, vertical fitted LED Taillights and the rear side bumper. Interior Cabin Design offers a true meaning of comfort and sheer luxury with having comfortable leather seating to have an ease of legroom and headrest space for passengers. The front side dashboard cockpit panel adds a significant appeal for customers. The advanced key essential features are included as air-conditioning, power steering, power windows, anti-lock braking system, central locking, and dual airbags system. The back side opens flat trunk compartment offers vast cargo storage accommodation with increased loading space and powerful towing capacity. Moreover, the side doors provide much convenience in entry and exit for passengers with low floor cabin and firm handle grip. It is a right-hand fuel-efficient provides high-end powerful driving performance fitted with 2.5 liters of the turbocharged diesel engine and 2.7 liters of petrol powered by manual speed gear transmission. 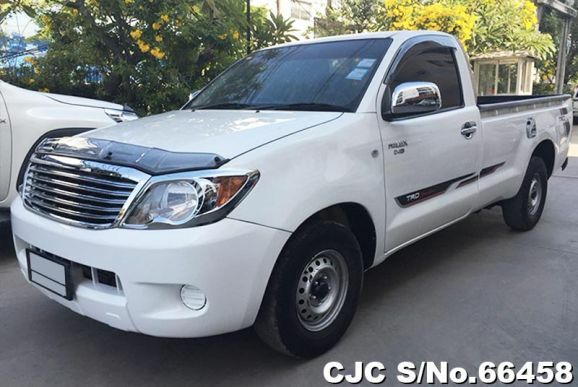 This Trendy and Stylish Sporty Thai Made Single Cabin Toyota Hilux is the most demanded used pickup truck much popular among people in Tanzania. It offers a lot of fun and leisure recreation journey on all kinds of rough terrains to have a stable and smooth on-road and off-road exciting drive for all young generation Tanzanian customers.